Announcing Anderson Hearth & Home's Winter Savings Special on our Regency Fireplace Products! 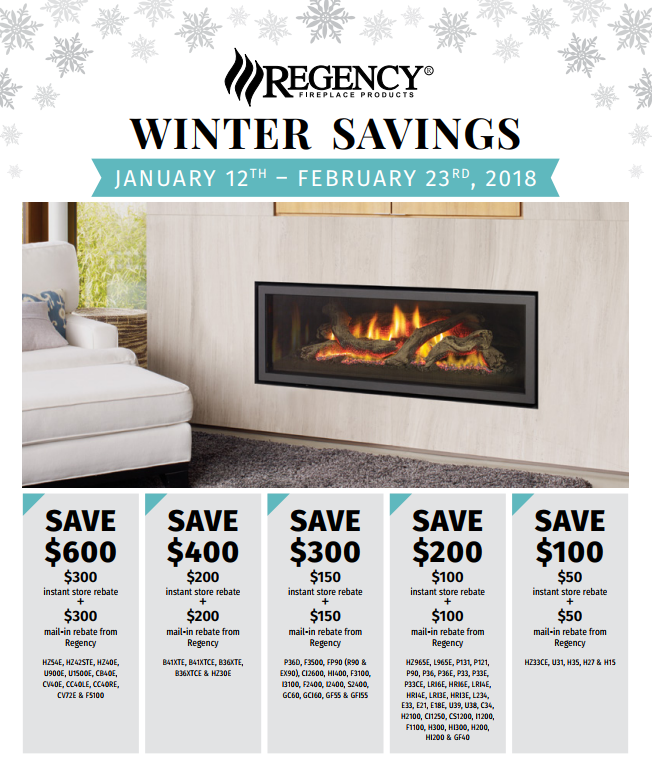 January 12th, 2018 - February 23rd, 2018, customers can receive up to a $600 rebate for purchasing a qualifying Regency product as listed. The rebate is split between Anderson Hearth & Home and Regency. We will offer a $300, $150, $100, or $50 instant rebate on eligible products. In addition to the instant rebate, Regency will pay a manufacturer's mail in rebate to match the instant discount. This rebate offer is limited to (1) rebate per serial number. Serial numbers claimed in previous Regency promotions are not valid for this offer. Checks are sent solely to consumer addresses - Dealers can not complete or mail rebates on behalf of the consumer as they may be denied. Consumers have until May 04, 2018 to submit their rebate online and postmark their rebate forms. Don't miss out on this offer, visit our showroom today!